The case against Parliamentarian Udaya Gammanpila, who is accused of misappropriating Rs. 20 million belonging to Mr Brian Sheddick, an Australian national of Rs.20 million was heard before Colombo High Court Judge R. Gurusinghe yesterday (11th). 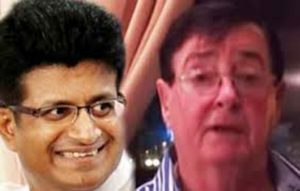 Giving evidence Mr Brian Sheddick said Udaya Gammanpila who was employed in his iron factory has misappropriated Australian dollar 200,000 that belonged to him. Mr Sheddick said he came to know about the crime from Pan Asia Bank. The Leader of Pivithuru Hela Urumaya Udaya Gammapila is also accused of 4.1 million shares belonging to Mr Sheddick that were in Pan Asia Bank using a fraudulent power of attorney in or near 27th July 2000. Accordingly, the Attorney General has filed a case against MP Udaya Gammanpila for cheating a sum of Rs.20 million and misappropriating another Rs. 21 million. Mr Brian Sheddick and his wife Jay Sheddick have arrived in Sri Lanka from Australia to give witness. Mr Udaya Gammanpila was present in the Court. He should be punished and forced or ordered to pay back the money. All politically affiliated in SL seem to be above the law and never get punished for their crimes.We need a change in our culture to put the country right.